“Web design best practices” isn’t just a buzz phrase. In any profession or skill, understanding the best core methods can help you create the best results. When it comes to creating custom websites, the final product is always different, but each site should have some traits in common. These traits are important for user experience. They’re important for getting your website to appear on search engines. They’re even important for paid ads. Together, they’re important for the growth and health of your business as a whole. Some of these web design best practices are technical. Some are guiding philosophies to keep in mind. All of them will help your business have a website both you and your visitors love. Sucess in business or life, in general, comes from understanding why you’re doing something in the first place. When you don’t answer the question beforehand, you don’t get the best results. You’ve been to a website like this before. When you visit the site, it doesn’t make an impression on you. You’re not sure what to do next. The company’s mission isn’t clear. If you have a website already, think about the impression it has on your current visitors. Is your purpose clear? Do you have a unique selling proposition to share? Do they know what steps you want them to take? When you work with a full-service marketing agency like MLT Group, we can help you answer those questions. The process doesn’t have to be complicated, but it has to occur. While you’re thinking about the ‘why’ behind a website for your business, let’s dive into some specific best practices. Per Statistica, 52.4 percent of all search traffic comes from mobile phones. Google announced that it will shift to “mobile first-indexing.” This means that Google will first look at the mobile version of your website when it decides how high it wants to rank your website. If your mobile website has a bad user experience, or, even worse, you don’t have a mobile website, you will lose out on website traffic, leads, and ultimately sales. Also, not having a mobile-friendly website is just bad for business in 2019. Without knowing you, I know you have a smartphone. Knowing how much you interact with the web through your phone should tell you everything you need to know. This is where responsive design comes in. Responsive design goes a step above and beyond creating a mobile-friendly website. With responsive design, we build websites that accommodate any screen size from phone to tablet to desktop. Reponsive design is even better than building a mobile-friendly website because it’s more cohesive and uniform. On each page of your website, you must consider the action you want your user to take and then create a design to accomplish that goal. This is known as user experience design. You can dive deep into the topic of UX and discuss different aspects, but the key is to figure out how to create a great user experience on every page of the website. When we work with clients, we discuss these elements in-depth, but they’re all results of the user experience you want to provide. If you do the process backward and piece elements together without understanding what you want to achieve, you often achieve nothing. Your homepage is the most critical page of your website because it’s the first thing people see. Internet visitors are picky and will leave your site quickly if your design doesn’t entice them to view more. This is bad for multiple reasons. One, you don’t want visitors to leave your site right away because, duh. Second, if people visit your site and leave right away, it can have a negative impact on your search engine rankings. Each time a visitor comes to your site and leaves right away, you get a “bounce” which is something Google doesn’t like to see. So how do you come up with an attractive design that makes people want to click through? Here are some of our homepage design best practices. For your website design, make sure you utilize the important areas of your homepage that appears above the fold. Your header and banner space is usually a wide horizontal space that goes across your entire screen. There are many different ways to design this space and add content, but you want to make sure to add your most important information in this area. 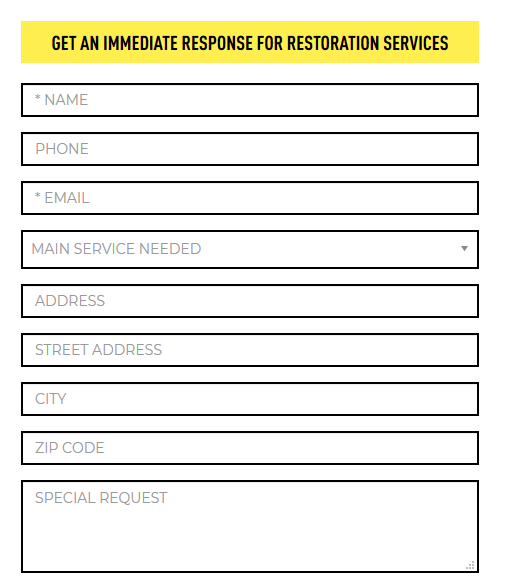 Here’s another example of a company who shows their unique selling proposition with a call to action (CTA) to go to an important page on their website. 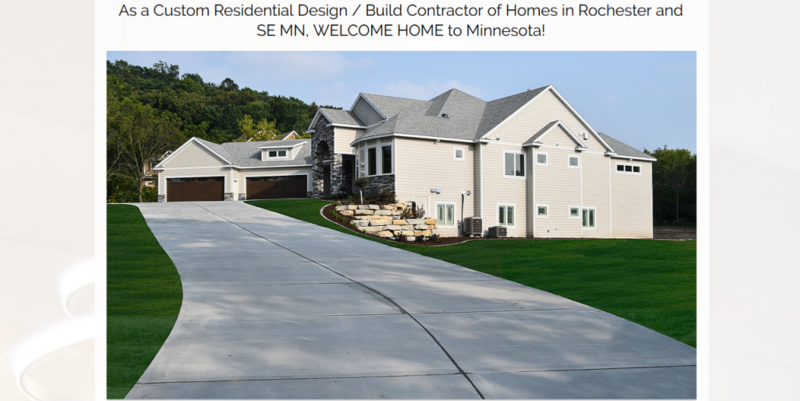 Some industries, like real estate and custom home building, utilize images to show off the quality of their work. When you work with a design and digital marketing agency, you’ll go through a question and answer process to figure out the most important aspects of your business. Then, those aspects will be incorporated into the design and content. Visual cues help people understand what to do next. Graphics and buttons take the guesswork out of decision-making for your visitors and make your website look more professional and fun. “Break out boxes” are a classic example of great use of graphics. Break out boxes are graphics that feature and link to important pages on your website. Always think of ways the content on your site could be represented with graphics and images instead of text alone. Your interior pages are all the other pages on your site besides the homepage. With each page, you should set an intention for the desired result you want to achieve. 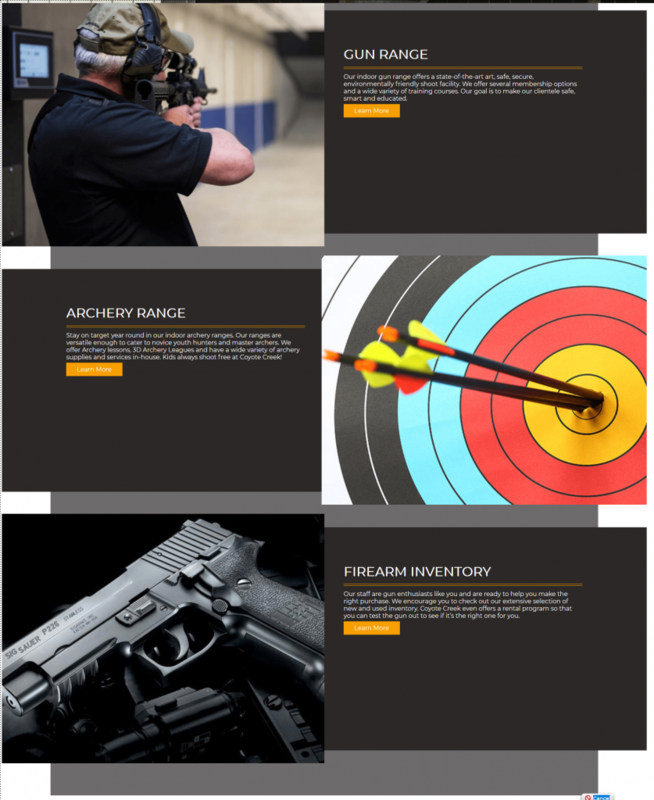 There’s a theme here – always put your visitor in mind before you design a website page. What do you want visitors to do while on this page? How do you want visitors to feel while on this page? What impression do you want to provide when visitors land on this page? Let’s take a look at some of our clients’ websites and break down the strategy behind their page designs. 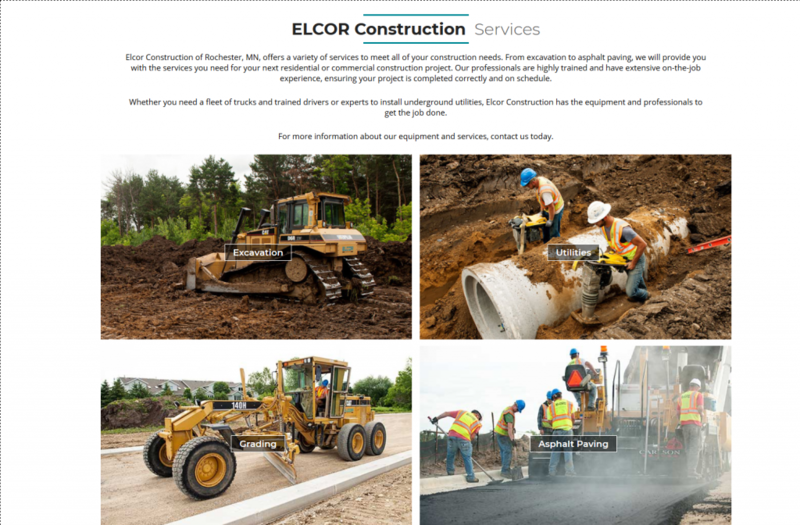 Elcor Construction provides paving and excavating services. 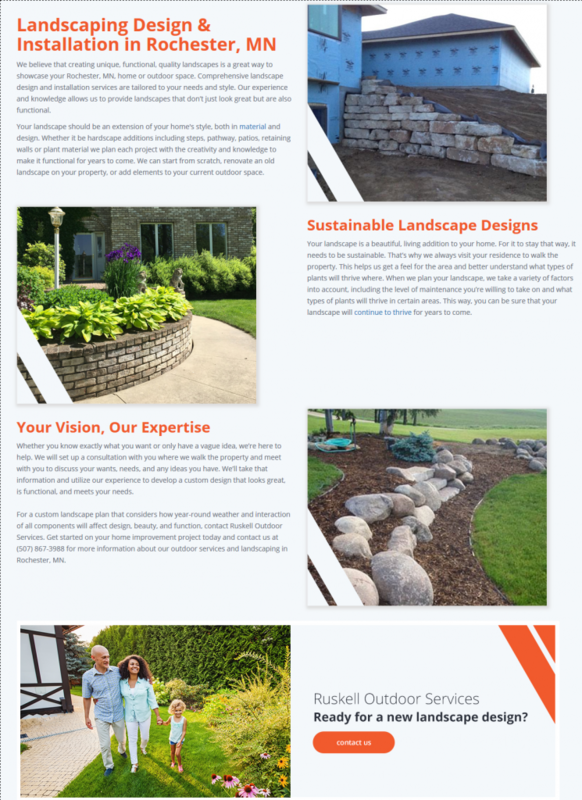 The design on this page helps reflect professionalism, the quality of their work, and the idea they want the visitors to get the information they need quickly. 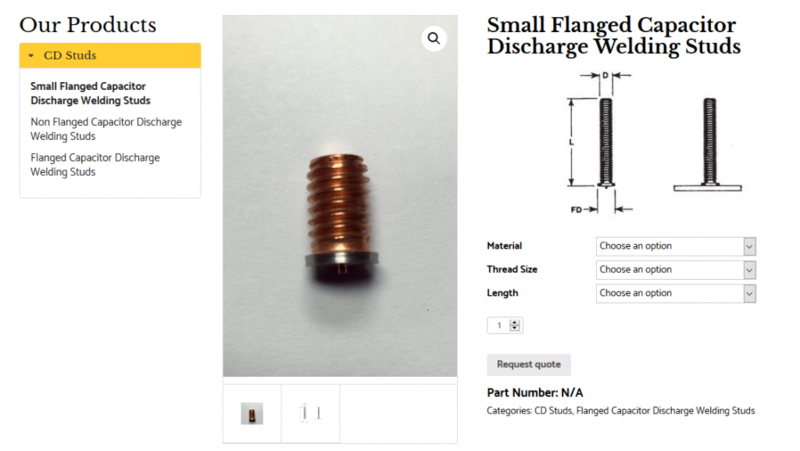 Northland Fastening Systems provides stud welding equipment. Visitors can find the exact part they need. Other stud welding providers may ask to look through an entire table of numbers to find their part. This design strategy saves time and gives the user the impression they are working with a large company who can handle all their needs. The sidebar menu also helps visitors find related products they might also need. Each product photo uses high resolution, color balanced, and enhanced photos to make sure the custom quality comes across on the page. Some pages are one-of-a-kind unique. That’s exactly the type of design we created for 12 For Health — a health and wellness company. 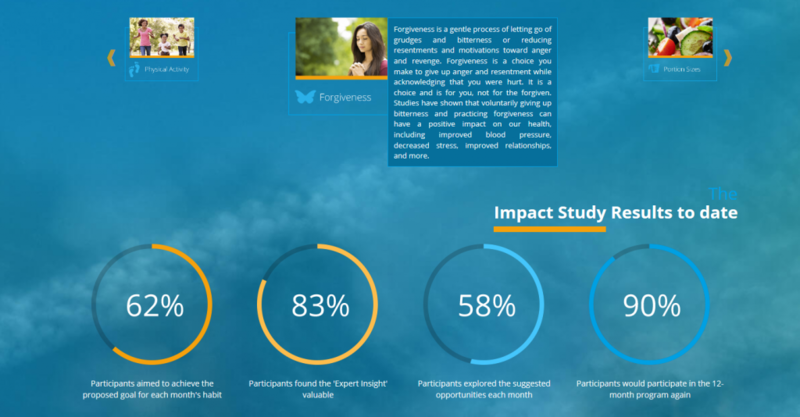 The design also includes important statistics that show the importance of adopting healthy habits. The color palette evokes positive emotions associated with a healthy life. The interactive style speaks to a sense of activity, which is a big part of a healthy lifestyle. If you use a specific focus and intent on each page you create for your website, you’ll guide the user experience to help the visitor find what they need and achieve your desired outcome at the same time. 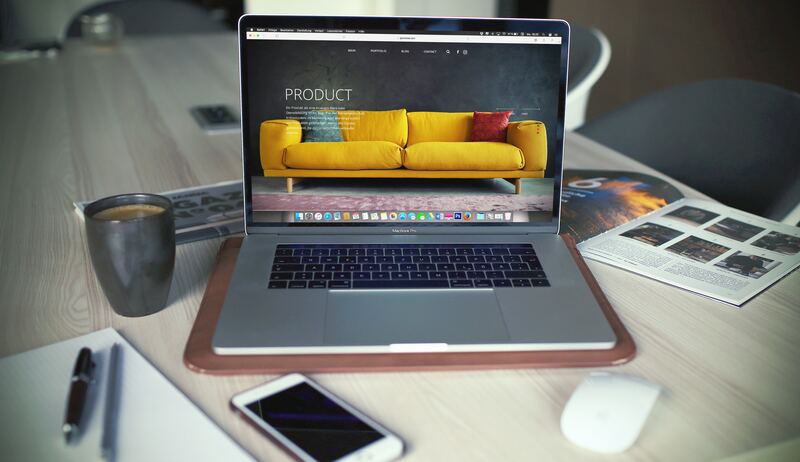 Aside from specifics for the homepage and interior pages of your website, there are some general web design best practices you should always follow. The way you design your website has an impact on how well it will rank in search engines for a number of reasons. That’s why it’s important to have a digital marketing plan in place to decide how the content will work within the frame of the website. There are also specific design techniques you can use or avoid to help your site’s SEO performance. When you work with a smart digital marketing agency, they’ll take a large number of factors into consideration. Here are some important elements to consider. Often, the longer the content on your website, the better. The search engines want pages with as much information as possible. This has to be balanced with the design of your website. You don’t want readers to feel overwhelmed by your content. Fortunately, there are techniques you can use to weave the content into the design in a way both search engines and users will enjoy. Subheadings (H1-H5) help break up the copy and give your reader a mental break between paragraphs. You can add images between content areas and even wrap them around the text of your website to enhance the way your content looks on the page. Let’s say you have a service page that has multiple sub-services underneath it. You can make each section of the service look unique by creating a panel for it. 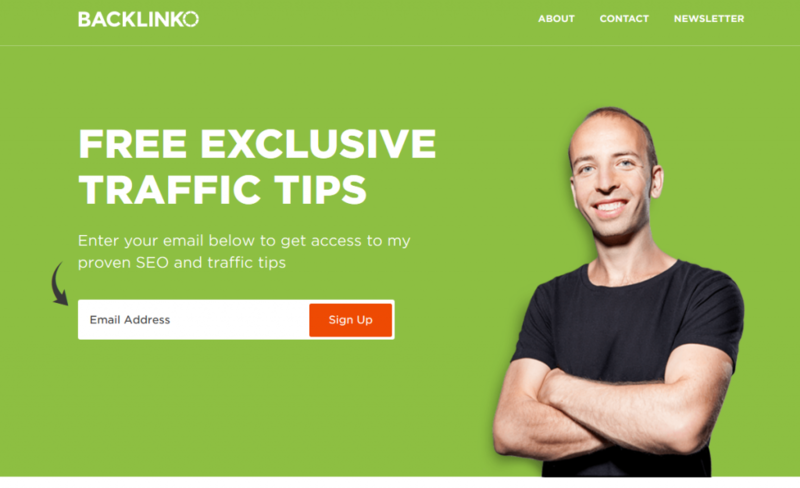 Getting traffic to your website won’t make a difference unless you convert that traffic into a lead or a sale. Your website design should have multiple areas with calls to action (CTAs). CTAs come in many forms. In addition to displaying your phone number on your website, you want users to be able to contact you by email. You can create forms and place them in high-traffic areas of your website. This will give them the chance to reach out to you if they have questions or want more information. Email marketing is still one of the top channels for communicating with customers and potential customers. They need a reason to sign up and they don’t want to feel like they’ll be receiving a newsletter — they want value. How do you both provide and communicate that value? Here are some tried and true techniques. You can offer visitors a valuable resource and ask them for the email address. You want your email sign up form to appear where visitors are most likely to engage with it. Although many people don’t like them, numbers show they work. If you want to be less aggressive, you can create an “exit intent” pop up that only appears if the user is about to leave the website. 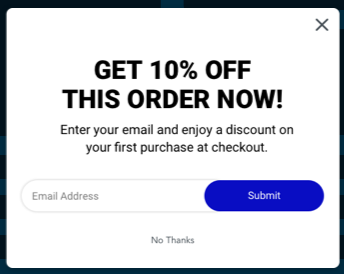 Often, you want to embed your signup form in an area that’s clear, visible, and obvious, like the banner space area of a page. Many people still want to call your phone number directly. You can use the header space of your website to display your phone number and add it in other relevant spots like your footer, contact-us page, and even at the end of your blog posts. This is just a short list of the web design best practices you can use to create a website both users and search engines love. A clear digital marketing plan from start to finish makes a world of difference when it comes to the success of your website. Why not work with an expert team to help you?